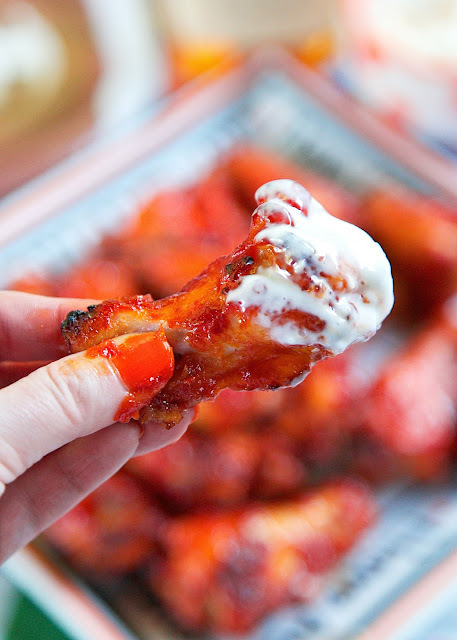 Bourbon Glazed Wings recipe - chicken wings marinated in a quick homemade bourbon hot sauce then baked. These wings were SO good! I am going to make them again for dinner this week. There weren't any left! We had a few people over to watch football last weekend. I served these Bourbon Glazed Wings. They were awesome!! I am still thinking about these wings. I am probably going to make them again one night this coming week. They were super good! I used Maker's Mark in the sauce because that is what we drink. If you like Jim Beam, Jack Daniels or another whisky/bourbon, feel fee to use that. The wings are marinated in the sauce and then baked later. I let the wings hang out in the fridge overnight and baked them before everyone got here. I served the wings with some ranch and bleu cheese dressing. I put out a bowl for everyone to toss their bones into after they ate the wings. Once everyone was done, I threw the bones into our awesome new InSinkErator Evolution Excel garbage disposal and let it grind them up. Super easy clean up and my house didn't smell like wings and drive the kitties crazy! They love chicken; especially Squeaky. She goes nuts when she smells cooked chicken. It was great to just toss the bones in the garbage disposal and not have them in the trash. In a large saucepan over medium-high heat, whisk together bourbon, ketchup, hot pepper sauce, tomato paste, brown sugar, onion powder and garlic powder. Bring to boil. Reduce heat and simmer until sauce thickens slightly, stirring occasionally, about 10 minutes. Season marinade with salt and pepper. Remove marinade from heat; cool to room temperature. Place chicken drumettes in ziplock bag. Pour 1/2 cup of marinade into bowl and set aside. Pour remaining marinade over and turn drumettes to coat. Refrigerate drumettes and reserved sauce overnight. Preheat oven to 375°F. Line baking sheet with foil. Place cooling rack on top of prepared baking sheet. Arrange drumettes on rack, spacing slightly apart. Bake drumettes (still on cooling rack) for 25 minutes. Remove from oven, brush with some of the reserved marinade. Return to oven and continue baking for another 20 to 25 minutes. Remove from oven; brush drumettes with more of the reserved sauce on both sides. Transfer drumettes to serving platter. Serve with ranch and bleu cheese dressing. The wings sound awesome and I must try them soon. 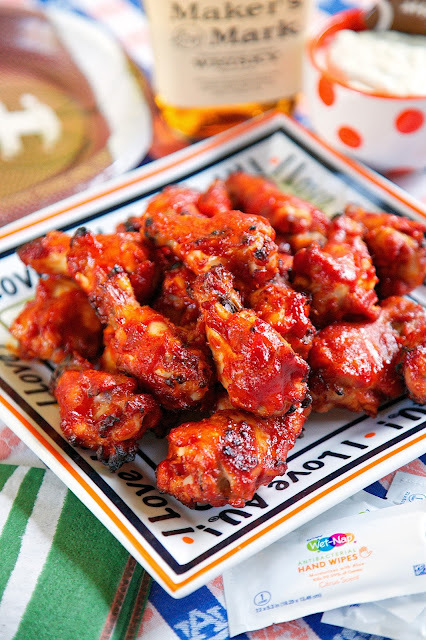 I love that you marinade and bake them instead of frying...d-lish!